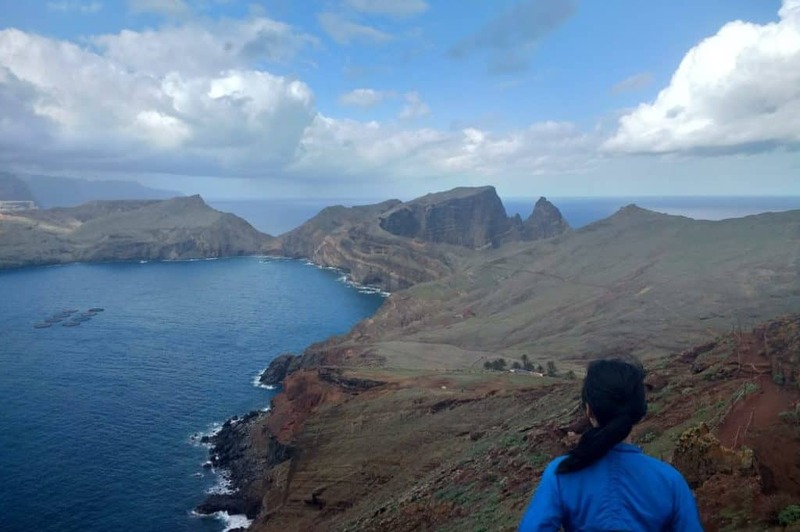 It was my second day of a week-long winter vacation on Portugal’s magnificent Madeira island, and the Areiro-Ruivo trail fit the bill for a rugged, yet not overly strenuous hike through some stunning landscapes. With its breathtaking views, precipitous passageways, and verdant cliffs, it was a magical experience—an experience enhanced by the diverse ages of people on the hike. This beloved trail hosted multiple generations of outdoor lovers from 60-something pensioners to 30-something backpackers down to primary-school-age kids with their families. And that cross-section of travelers on the trail hinted at Madeira’s secret to being a winning destination for travelers: It’s growing appeal to all ages. Teleférico view of Funchal, capital of Madeira. Before heading to Madeira in December, I knew little about the island except that it a) had a reputation as being a hikers’ paradise because of its mountainous terrain, b) promised good food, especially seafood and tropical fruits, c) would be warmer than most of the rest of Europe in winter, given its proximity to Africa, and d) could claim soccer superstar Cristiano Ronaldo as another famous export besides its sweet namesake wine. I had also read that Madeira, once a prime vacation spot for pensioners from the UK and other parts of colder-climate Europe, was changing into an all-ages destination. For destinations that depend on tourism, age diversity not only means support for a broader variety of local businesses, but also greater loyalty among its customer base. For example, in the restaurant industry, when a destination attracts travelers from different age groups, the fast-casual, local menu-of-the-day, and Michelin-starred restaurants—that is, budget, mid-priced, and luxury—can all benefit from a share of tourism dollars. What’s more, a destination that caters to a diversity of ages means children, youth, and young adult travelers are more likely to return – having been introduced to those destinations at a younger age. What Madeira has done really well is provide affordability, accessibility, and an assortment of adventure activities to draw in travelers from across the age spectrum. As more people travel internationally to more destinations in the same year, low cost airlines and budget accommodations are among the biggest considerations for destination selection. This is especially true for younger travelers with limited disposable incomes. Madeira is not only served by several low-cost airlines, but has also seen discounted airfares from major airlines. 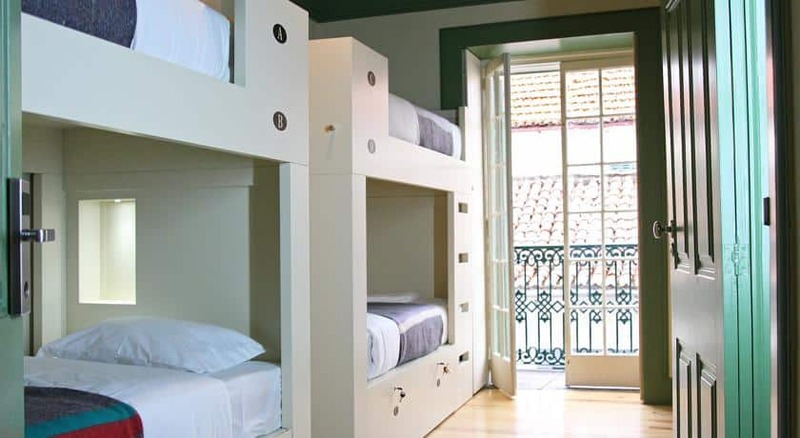 View of shared dorm room at my second hostel in Funchal (photo from Booking.com). Additionally, while budget hotels and home-sharing services like Airbnb are popular with these travelers, hostels are often the go-to accommodation of choice, not just for the lower price point, but also for the chance to meet (and team up) with other independent travelers. In recent years, Madeira has seen several new hostels opening up in the center of Funchal, the capital. I ended up staying in two—one, a worn, bare-bones but comfortable hostel, and the other, beautiful, modern, and ultra-efficient. In both, I met friendly travelers of varying ages from around the world, most of them skewing toward 20s and 30s. And in both hostels, a bed in a shared dorm room cost around €17 (about USD 20) per night. 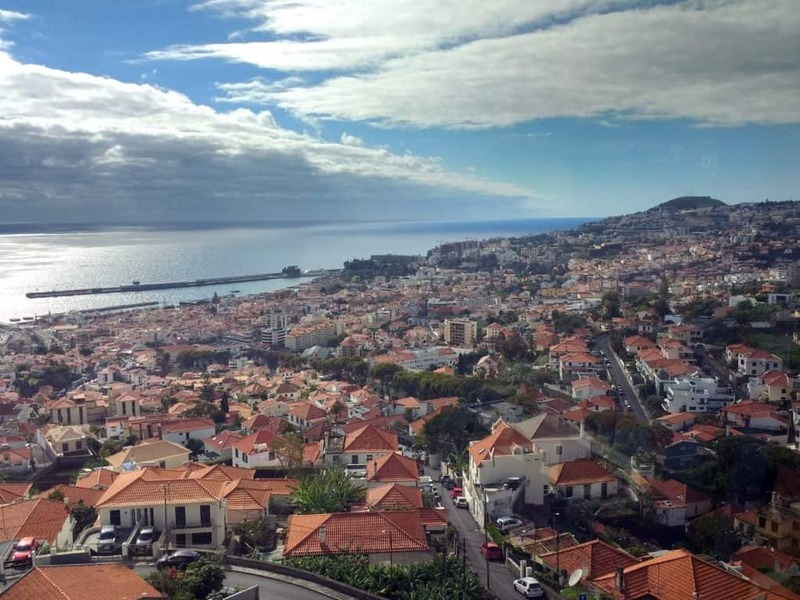 In talking with my fellow hostel-mates, I learned that a combination of affordable flights and the availability of hostels helped put Madeira on their travel list, as on mine. Madeira also made it on to our wish lists because of its world class hikes and walks—part of the growing adventure-travel niche. Besides hiking alongside peaks, such as Picos Areiro and Ruivo, there are dozens of hikes along Madeira’s famous canals, known as levadas. 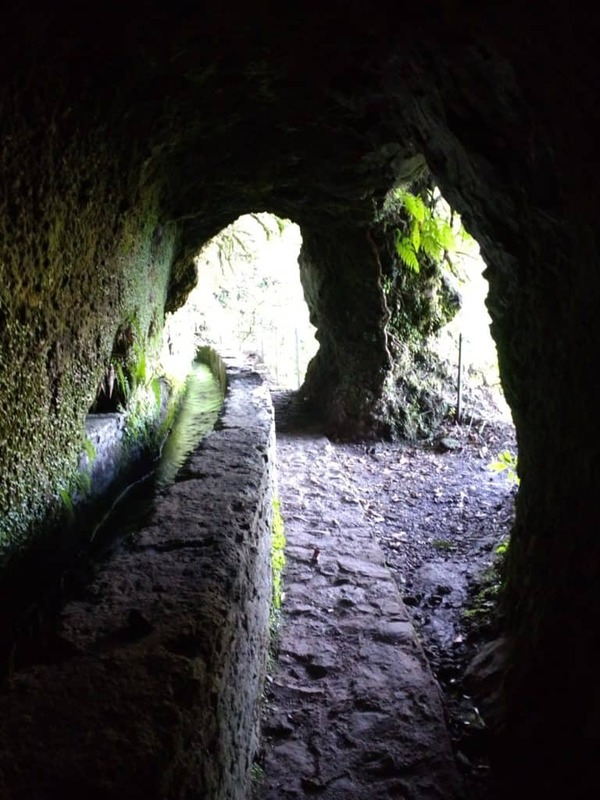 These levadas, originally built in the sixteenth century, brought water from the west and northwest of Madeira to the southeast for agriculture. One of several levada tunnels that you encounter on the Caldeira Verde walk. Today, the levadas continue to provide water to the south of the island, and with the additional service of providing hydro-electric power. The more than 1,350 miles (2,170 km) of levadas on the island often have the additional benefit of serving as walking paths, some an easy walk and others involving tough climbs and hair-raising descents. During my three hikes—Picos Areiro to Ruivo, São Lourenço, and Levada do Caldeirao Verde—I was impressed with not only the amazing scenery but the general upkeep of the trails. They were well marked and well maintained, making it hard to get lost and easier to avoid dangerous spills. View from the São Lourenço trail. Besides all of the walks and hikes, the hostels I stayed at provided information on several outdoor guides and trip operators for other adventure travel activities like canyoning, diving, and snorkeling. While I didn’t book any guides or trip operators, the fact that such offerings existed meant there was a healthy number of travelers interested in them – with much of that interest from younger travelers. Madeira makes itself accessible, by providing good, traveler-friendly information and serviceable public transit. For travelers who prefer to explore on their own, this accessibility can also help make a destination more appealing. One of the covers for the Funchal USE-IT map and guide (2017 edition). Upon my arrival at my first hostel, the owner provided me with two free guides that were indispensable to my stay on Madeira. 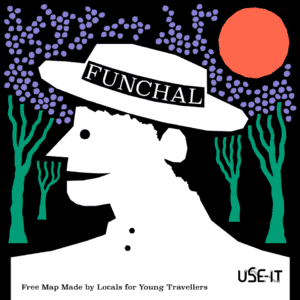 The first was a handy map and guide to Funchal, by the European grassroots volunteer group USE-IT, which “stands for no-nonsense tourist info for young people,” according to their website. Not only did the map orient me, it provided information on history, local foods, festivals, must-see sites, and other things helpful for travelers, including transport options and how to find free wifi hotspots. The USE-IT guide was so useful it barely survived the trip, after being hauled around in my backpack and opened countless times. The second guide, a three-page pamphlet, presented over 20 hikes on the island, many of them levada walks. The pamphlet made planning for these levada walks easy, including transit options to reach them. You can even check out weather conditions at key locations by means of web cams scattered throughout the island – another useful tool for travelers to plan their itineraries. Public transit, while not very frequent and not widespread on Madeira, did make it possible for me (car-free on vacations for five years and counting) to be able to do the Levada do Caldeirao Verde hike on my own. The São Lourenço hike can also be reached by bus. For the car-accessible-only trail from Picos Areiro to Ruivo I was able to split the costs of a cheap two-day rental car with a friendly group of travelers—a couple of Czech sisters and a Slovak solo traveler— from my first hostel. The Slovak told me of another hike that he had done taking the public bus. The guide listed a few others accessible by bus as well. While renting a car is desirable for experiencing the best of Madeira, you can still experience many of the island’s highlights by bus with careful planning and enough time (say, a week or more). Given all this, along with impressive scenery, world class food and drink, and living cultural heritage, it’s not surprising that the 2017 World Travel Awards (the “Oscars of the Travel Industry”) gave Madeira the title of “World’s Leading Island Destination”—a title it has now held for three consecutive years. Even more important, by drawing in a younger set of travelers through its strengths—accessibility, affordability, and adventure travel—Madeira isn’t only promoting destination loyalty but ensuring tourism longevity. Eugene is an outdoor, travel, and food enthusiast. She has worked in the eastern U.S., Ecuador, and Spain on sustainable ag/food policy and educational initiatives. This entry was posted in Geotourism, Geotravelers and tagged best practices, geotourism, Madeira, tourism management by Eugene Kim. Bookmark the permalink.